RELEASE PROPHET NNAMDI KANU AND OTHER BIAFRANS NOW! LET BIAFRANS GO!! The Biafran Nation is known as, “The Land of the Rising Sun”, which found her origin from ChukwuOkikeAbiame(God The Creator). The Same Spiritual Principles and formations that gave birth to Israel, were the same that gave birth to Biafra. These spiritual conformities were revealed to Prophet Nnamdi Kanu by ChukwuOkike (God the Creator) after several encounter and dealings with God. 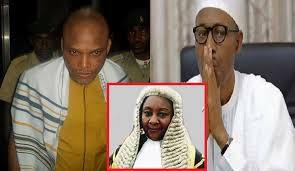 Prophet Nnamdi Kanu was judged faithful to be sent for the liberation of Biafra and Africa at large by God. Prophet Nnamdi Kanu, through IPOB as the leader of the Indigenous people of Biafra in truth and honesty, has been ordained spiritually and physically by God and Biafrans in general to lead Biafrans and Biafra, the God’s nation on earth, out of the colonial masters’ slavery which is human injustice to his fellow human. This Divine Spiritual Law is in concord with the UNITED NATIONS DECLARATION ON HUMAN AND PEOPLES’ RIGHT of 2007. By virtue of this and in pursuance to Articles 3 and 4 of this Charter-interpreted for our purposes below and its objectives. We the Indigenous People of Biafra under Article 3 of the above UN Charter, have the right to self-determination. By virtue of this right, we wish to freely determine our political status and also to freely pursue our economic, social and cultural development. We the Indigenous People of Biafra under Article 4 of the above UN Charter, is free to exercise our right to self-determination, we have the right to autonomy or self-government in matters relating to our internal, external and local affairs, as well as ways and means for financing our autonomous functions. If truly Nigeria is under UN with civilized leaders and citizens who obey the rules and constitution of the Land, why is the Leader of the Indigenous People of Biafra, Kanu still in detention after the Courts of Competent Jurisdiction have given their verdict in his favour? It will be recalled that Kanu was arrested and arraigned secretly at the Magistrate Court, Wuse II, Abuja by the DSS, but was later granted bail on October 19th, but he hasn’t been released. Because Prophet Kanu has no case to answer as well as other Biafrans in various cells in Nigeria; the government decided to use delay tactics of adjournments through some corrupt judges that lack professional integrity. IPOB supporters have been protesting peacefullyagainst unjust detention of Kanu and other Biafrans in various Nigerian cells in Rivers, Anambra, Abia, Enugu, Imo and Delta states and all over the world. Detention of the Leader of the Indigenous People of Biafra and other Biafrans is not the best idea and does Nigeria no good. It is high time Buhari led government accepted the inevitability and reality of Independence coming to one of their major giant, Biafra which was amalgamated with Nigeria in 1914. As the British did in late 1950s during the post independence of one of their major colonies in Africa called Nigeria when Britaindecided to hand over power to Nigeria, they brought a new Governor General from the Sudan, Sir James Robertson, to take the reins in Nigeria. Sir James Robertson who used his position to select Harold Smith and rigged Nigeria’s first election so that its compliant friends in Northern Nigeria would win power, dominate the country, and serve British interests after independence. In that sense, Nigeria’s independence had a British Governor General in command, one might say, popular faith in genuine democracy was compromised from its birth. Within six years of this tragic colonial manipulation, Nigeria was a cess-pool of corruption and misrule. Elections were blatantly rigged. The subsequent national census was outrageously stage-managed; judges and magistrates were manipulated by the politicians then as Buhari is doing today. The social malaise in Nigeria society was political corruption. The structure of the country was such that there was inbuilt power struggle among the ethnic groups, and of course those who were in power wanted to stay in power. The simplest and easiest way to retain power, even in a limited area, was to appeal to tribal sentiments, so they were egregiously exploited in the 1950s and 1960s. The original idea of one Nigeria was pressed by the British colonial masters to enslave Biafran region. With all their shortcomings, they had this idea to build the British amalgamated country as one, without considering the cultures and belief of the people. The Northern Peoples’ Congress of the Sardaurians was supposed to be a national party, yet it refused to change its name from Northern to Nigerian Peoples’ Congress, even for the sake of appearances. The then Prime Minister of Nigeria, Late Sir AbubakarTafawaBalewa, did nothing to save his country from impending chaos. Despite that Late Dr. Nnamdi Azikiwe stated thus,“Nigeria was given her freedom on a platter of gold”. As God has ordained Biafran’s freedom to come through His Prophet, Nnamdi Kanu, for the fulfillment of the prophecy in Hosea 12:13, “And by a prophet the Lord brought Israel out of Nigeria, and by a Prophet was He preserved.” Biafra is Nigeria’s Israel.The British knew and made certain on the eve of their departure that power went to theirstooge in the country that had played no real part in the struggle for independence. This was the situation in which Prof Chinua Achebe wrote one of his novels titled: A Man of the People. And other statements like,“Divided we stand while united we (Nigeria) fall”. Whereas, the North sees the Biafran Land as a conquered territory (SE / SS) that is why the previous and Buhari led federal government of Nigeria keep on waging war of aggression against Biafra and her people before and after the civil war. And Buhari led government killed IPOB peaceful protesters in Anambra, Enugu, Delta, Abia, Imo, and Rivers states, respectively and presently using operation python dance to continuously kill Biafrans in the eastern region. On this note, it is indispensible to draw the attention of the world power: UN, EU, AU, US and Israel that Buhari is not fighting a new war but an old war of invasion of Biafra land because of her human resources, oil and other natural resources. But Buhari should be warned that his time is up in the continual Jihadist war against Biafrans which started in 1967. Whereas, what happened recently in Southern Kaduna is one of the things we are emphasizing on, it is part of aggression of Buhari’s led government to kill and Islamize Christians and non-islamic believers through Jihadist war of conquest.Buhari’s led government is a killer and has no respect for human life. Thank God that the spirit of Biafra has risen to destroy the Buhari led government and his Islamic agenda against Biafra. Buhari should know that ideology can never be killed, as Biafra is an ideology that gave birth to so many Nnamdi Kanus. There is no going back, no retreat no surrender because Biafra and IPOB is beyond Nnamdi Kanu. To restore BIAFRAN NATION is a task that must be done spiritually and physically. To dismantle the Lord Lugard amalgamation of 1914 is a task that must be accomplished. Our son, the prophet of our time, Nnamdi Kanu and others being held in various Nigerian prisons must be released unconditionally. Let my people go to our promised land, Biafra (The Land of the rising sun), the land of equity, where there is no segregation, where people learn and develop like all other developed nations, where science is the foundation with the fear of God. The Lord spoke to Moses in the land of Egypt, ‘I am the Lord. Tell the King of Egypt everything I tell you. The Lord says ‘I’m going to make you like God to the king and your brother Aaron will speak to him as your prophet’. –Ex. 6:28.So Moses and Aaron went to the king and did as the Lord commanded, Aaron threw his stick down as the Lord commanded and it turned to snake. Then, the king called his wise men and magicians and by their magic they did the same thing. They threw down their sticks and their sticks turned into snakes. But Aaron’s snake swallowed theirs. The king however, remained stubborn just as the Lord Has said that the king will not listen to Moses and Aaron. This is howBuhari’s led government has adamantly refused to listen to the call for the release Nnamdi Kanu and let Biafrans go.- Ex. 7:10-13. Blood, fishes in their rivers and lakes stink. Exodus. 7:14-25. Then, frogs in the rivers, lakes, land and the houses, with the bodies of the king and his nobles full with frogs.- Ex. 8:1-15. Death of animals, the whole animal in Egypt except animals of Hebrews died. Ex. 9:1-7. Locusts ate everything that hails did not destroy, the trees that left undestroyed, the houses of Egyptians, the king and his nobles. Exodus. 10:1-20. The Egyptians could not see each other. Exodus . 10:21-29. Death of the first born; all first born of Egyptians died. Exodus. 12:1-26. IGBOS ARE HEBO-HEBREWS RESIDING TODAY IN NIGERIA, WEST AFRICA. Our genealogy is from two Hebrew origins. The Eri clan of Gad’s tribe, and the Levi tribe. -Genesis 46-16 and 46-11. Our ancestral father Dabaw, a Jewish name or Dabawu as pronounced here in Igbo Land is from Levi tribe. God said they will not have a place of their own, as He has chosen them as His first born. Shared into the remaining eleven tribe, only the things offered in the sanctuary, offerings and other sacrifices of God, are their inheritance for they have the privilege of being His priests and Levites. Our ancestral father Dabaw was a priest from Levi tribe shared into Eri clan of Gad’s tribe and was their leader when the Midianites, Amalekites and the Desart tribes constantly raided them before they left their habitation and moved towards Egypt to Ethiopia to eastern Sudan and lived in different places and cultures before they got to this part of the world and settled in a place they named after where they left from in Israel called Eri Clan of Gad’s tribe, Eri, Umueri ( children of Eri) in Anambra River valley as the first habitation of the Igbos. This linage of Dabaw is the only people in Igbo Land that sacrifices when abominations are committed, or when one hangs himself, they are the people to loose and bring him or her down. If they are not found, their daughters and/ or sons will represent them and those things GOD said in the scripture as theirs will be given to them as their inheritance, sacrifices to GOD. OTHER EVIDENCE OF IGBO AND HEBREW RELATIONSHIPA. [B.] Names of their clans before they left Israel. [C.] Time or period, place they inhabited before they left Israel. [D]. Initially GOD was the only king in Israel before the Igbo ancestral fathers left, as man was not regarded as king, that is why up to this date the Igbos don’t believe in kingship. The elders and appointed age grades from time to time administer Igbo communities, coupled with prophesies from priests in yearly pronouncements at every end of Igbo year like the Aro Oracle in MmanomaNneyi Umueri, the first habitation of the Igbo Hebrews, a place they first lived when they migrated into Nigeria; the high priest that led them,Dabawu, came down with epode, urim, and thummim which reveals God’s wish for the people yearly as it is in Israel. [E] Coupled with Deep religious characters of both nations. [F] Practice of mummification and common sentences structures common to both Igbos and Hebrews. [G] Practice of circumcision on both side, formally only the Igbos do circumcision in this part of Africa, but now every nation has followed suit. [H] Custom of sacrifice and language peculiarities with idioms in Hebrew and Igbos of Biafra. [i] The Ajana(earth deity) in Igbo Land (Biafra) and stones taken from River Jordan, which GOD says will remind the people of what the lord has done for us,“when your children ask what the stone means, than you will tell them how River Jordan divided into two when the Arc of Covenant entered it, and the Levites caring the Arc stood on the stone in the river before the whole tribes of Israel crossed over, this twelve stones Joshua ordered one person in each tribe to carry one remains a monument in Gilgal, east of Jericho and middle of River Jordan and stands as witness between God and the children of Israel any where they are for generation yet unborn to be told what God did for Israel in Egypt, Red Sea, wideness, and River Jordan. Most, if not all earth deities in Igbo land (Biafra) are stone. 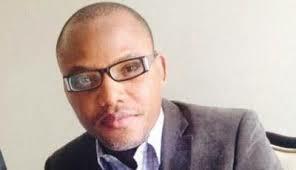 In conclusion, as the Cradle of Igbo(Biafra) Race and the custodian of the OvoIgbo (Biafra)and with the powers bestowed on us by ChukwuOkikeAbiame (God the Creator), we urge President Mohammed Buhari and his led government to obey the courts’ rulings and respect the Fundamental Human Rights of Prophet Nnamdi Kanu and other Biafran indigenes politically being detained by him and his government before the 31st day of January, 2017 or be the Pharoah of our time.